For Sciascia, others could talk, and he admitted enjoying their talk, especially at il circolo—the club. 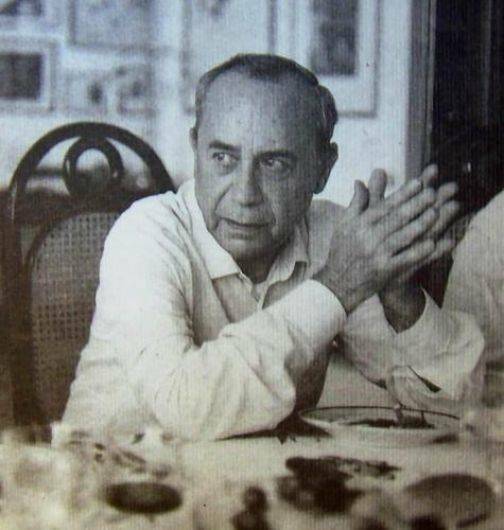 For him the circolo was pure theater, a late afternoon daily event when he was a young man in his native Racalmuto and, later, a meeting at the end of the day in its equivalent in Palermo—either in an art gallery or in Elvira and Enzo Sellerio’s publishing office (he was their first editorial director). Sciascia participated by being there, and watching. What he liked was for other people to talk, so that he could listen, study, analyze. Apply the wisdom acquired from growing up in a Sicilian town, studying in another Sicilian town to be a teacher, and then teaching Sicilian schoolchildren. When I interviewed him in the Seventies (I had known him already for some years), I would ask a question, which would be followed by what was for me an embarrassing, seemingly endless pause. He thought before speaking, just as he thought before writing. Perhaps that explains why he always went to Paris every winter, to tour the art galleries there. He was not expected to speak to the paintings, though they obviously spoke to him in a language he could understand. Paris and its arts were for Sciascia, a Mecca, and he always went there, from Palermo, by train. Why? Because that was how it was done, slowly, the noise of the swaying train cars drowning out all but one’s own thoughts (and the travelers must take the train to Palermo to know how much the cars sway and rattle on the old railway lines, quite unlike the Eurostars humming from Naples to North Europe). I once asked Sciascia about his writing technique. By then I knew what to expect, and so I steeled myself for a long and painful wait. In this way he was himself a maffiusu, one of those silent men who are surrounded by arm-tugging underlings who do the talking for him. Sciascia was hardly alone: many Sicilians did not talk, and what they did not talk about was the Mafia. Indeed, when Sciascia was first writing many still proclaimed that it did not exist at all. In a way his name said it all. It came from the Arabic, he told me, and it meant veil. In the Sicily of Sciascia’s era all seemed veiled, and nothing more so than the Mafia. But silent, thoughtful Sciascia helped to tear away its veil in his book of 1968, Il Giorno della Civetta, The Day of the Owl. The book about a Carabinieri captain who investigates a Mafia murder became a movie directed by Damiano Damiani starring Claudia Cardinale and Franco Nero, with a screenplay by the late, gifted Ugo Pirro. The film version was more or less damned by one American critic as “depressive.” Indeed—but then so are all Sciascia’s books. Only apparently detective stories, they plunge us into the deep well of corruption, they illustrate how political collusion with the Mafia (and not only with the Mafia) works, they read us the rules of a subtle game with cruel rules. Even the landscape darkens. As Gerard Slowey writes in his introduction to a 1998 reprint edition of Il Giorno Della Civetta, “Sciascia’s Sicily in this book…is a land with little colour, where the greenery serves only to highlight the ominous grimness of the chiarchiaro and the people dressed in black…” (Manchester University Press). His birth January 8, 1921, concided with the dawn of the Fascist era. He lived through the abortive assault on the agrarian, godfather Mafia under the Fascist Prefect Mori; through wartime and then the Mafia’s postwar rebirth as an urban force, first in contraband and then in the building trades, inevitably linked to politics, before the Mafia assumed control over the global drug market after 1978. Sciascia’s subtle portraits of Sicily mark his novels and essays, but he scandalized many when he attacked, in an article that appeared in Corriere della Sera Jan. 10, 1987, what he called the professional anti-Mafia caste, “i professionisti dell’anti-Mafia.” Just what he meant by that remains a matter of debate. Perhaps he felt simply that “everyone anti-Mafia isn’t made of solid gold,” to quote writer Santo Piazzese, writing in Venerdì di Repubblica this Sept. 11. Certainly, some of the key Sicilian protagonists at that time flaunted an heroic anti-Mafia stance for personal aggrandizement. Above all Sciascia was deeply suspicious of the mafiosi turncoats--i pentiti--whom he mistrusted, but whose revelations were the substructure of the famous so-called maxi-trial in Palermo in 1987. His writing the article offended many, particularly since that trial prepared by Judge Falcone produced more convictions than any previous Mafia trial, where white washing was more common. He believed that it was all too massive, too much tarring all with the same brush. To recognize a certain ambiguity, even in the difficult prosecution of alleged mafiosi, does at least provide a key into Sciascia’s way of thinking. The essence of Sciascia—the essence of Sicily, for that matter—is ambiguity, and, needless to say, he did not quite explain himself. Judith Harris, who has been visiting Sicily since 1961, has written extensively about the Mafia. She covered the murder of General Carlo Alberto Dalla Chiesa and the maxi-trial in Palermo for Time magazine and for the Wall Street Journal and was a field producer for the BBC-TV two-hour documentary “Mafia Wars.” She is at work on a novel, The Sicilian Bride.